Chevrolet dropped the much-anticipated Cruze diesel at the Chicago Auto Show today, saying that they're bringing a powerplant to America than can hold its own against any Volkswagen. They're calling it the Cruze Clean Turbo Diesel, as if to erase all doubts in the minds of American car buyers that diesels are dirty and underpowered. This new diesel engine is a modified version of a motor GM already uses on their cars in Europe. Let's talk numbers: It's a 2.0-liter four with 148 horsepower and a healthy 258 lb-ft of torque at 2,000 RPM. It also features an overboost feature that pushes torque up to 280 lb-ft for "stronger acceleration periods of about 10 seconds," GM says. Most importantly, they say it can achieve 42 mpg on the highway when coupled with an automatic transmission. No word from GM on whether a manual version will be available, but we can only hope so. Check out the full specs on it here. Interestingly, unlike Volkswagen's small diesel cars, the Cruze relies on a urea injection system to cut down on particulate emissions. GM says the car can go 10,000 miles without a urea refill, but that's one more thing to think about if you're cross shopping this against the Golf. Here is some footage of it driving around and filling up, just like a real car. See, American car buyers? You don't have to be terrified of diesel engines anymore! They're not going to explode and kill you or turn your children into beret-wearing socialists! 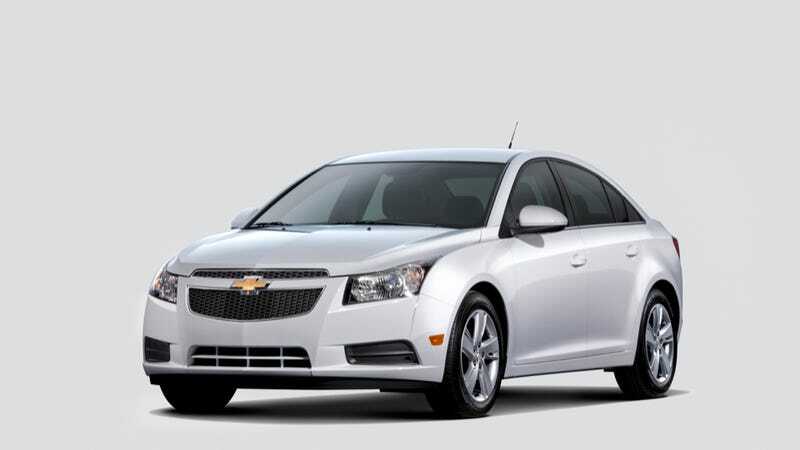 The Cruze Diesel will go on sale this summer for the low, low price of $25,695.